Sea-level in the region around Kosrae will tend to be around 3-4 inches higher than normal for the period March, April and May. This means all tide levels will be pushed up 3-4 inches. Rainfall is expected to be slightly higher than average (110%) for the April to June period. Beyond that, for the rest of the year, rainfall amounts are forecast to be around normal. 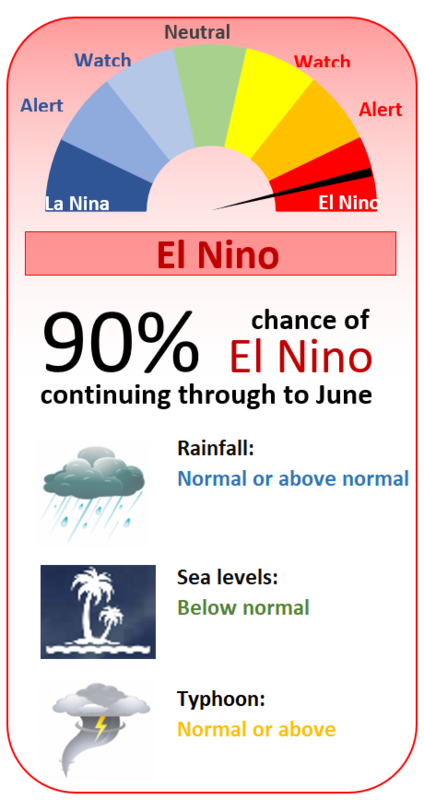 Further information is available from the Pacific ENSO Update newsletter. The highest tide levels over the next two months (and hence greater possibility of coastal flooding, particularly if large waves occur over the same period) are likely to occur between the 10 – 13 and 27 – 30 March, between 26 – 29 April and the 24 – 28 May. The revised Kosraean versions of the tide calendars are still being translated and will be uploaded shortly.